Children with autism and their families are invited to meet real-life superheroes – that is, local firefighters and police officers – during Sensory-Friendly Safety Day, presented by Centria Autism Services. 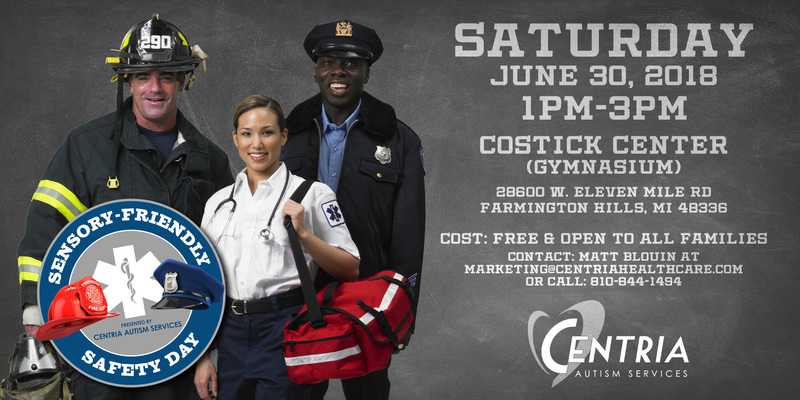 The event is free and open to families of all ages and abilities, and will take place at the Costick Activities Center in Farmington Hills on Saturday, June 30, 2018 from 1pm-3pm. The Farmington Hills Police Department and Fire Department will be on-site to meet and greet with kids, and provide useful safety information to parents. They will also be giving tours of a “sensory-friendly” fire truck and police car, which will not have any flashing lights or loud sirens. This will best accommodate children who have autism or sensory sensitivities. Sensory-Friendly Safety Day will also feature several kid-friendly activities inside the gymnasium, including a photo booth, a professional face painter, an arts and crafts table, safety sign games, a stop-drop-and-roll station, snacks, and more. The event will also feature resource tables from organizations such as Autism Moms Know Safety and Centria Autism Services. For more information, or to RSVP for Sensory-Friendly Safety Day, please visit http://www.centriaautism.com/events or call 1-855-772-8847. Centria Autism Services is an operating division of Centria Healthcare and a leading national provider of Applied Behavior Analysis (ABA) therapy for children with autism and their families. With its national headquarters in Michigan, and more than 2,000 clinical staff working in eight states, Centria’s Optimal Outcomes approach combines child-centered evidence-based ABA with best practices to help children with Autism Spectrum Disorder (ASD) have the best developmental experience possible and acquire the skills to reach their fullest potential. Autism is a general term used to describe a group of complex developmental brain disorders – Autism Spectrum Disorders – caused by a combination of genes and environmental influences. These disorders are characterized, in varying degrees, by social and behavioral challenges, as well as repetitive behaviors. An estimated 1 in 59 children in the United States have autism, an large increase in the past 40 years that is partly explained by improved diagnosis and greater awareness.